Tinos is one of the five islands which surround the sacred island of Delos; the others are Syros, Mykonos, Naxos and Paros. They were called Cyclades because they form a circle around Delos. 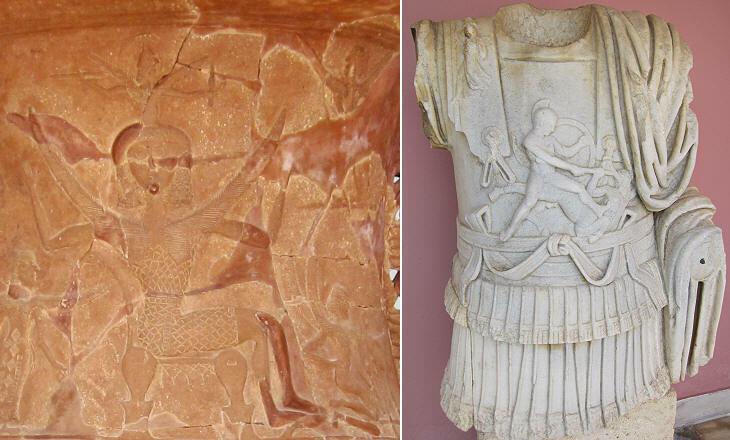 Tinos does not retain important monuments of its ancient past such as those which can be seen at Delos and Naxos, but its small Archaeological Museum has some very large jars with very elaborate reliefs. The island housed a sanctuary to Poseidon (Neptune) and his wife Amphitrite which flourished from the IIIrd century BC to the end of classical antiquity. After the 1204 conquest of Constantinople by the Frank knights leading the Fourth Crusade, the Byzantine Empire was partitioned. The Republic of Venice, which financially supported the crusade, obtained Candia (Crete) and Negroponte (Euboea), the two largest Aegean islands, while most of the smaller islands were acquired by Venetian families. Tinos (Tine or Tino in Venetian records) together with Andros, Skiathos, Skopelos and Skyros became a fiefdom of the Ghisi family. 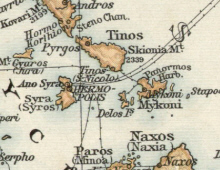 In 1390 the Republic established its direct rule over Tinos and Mykonos. 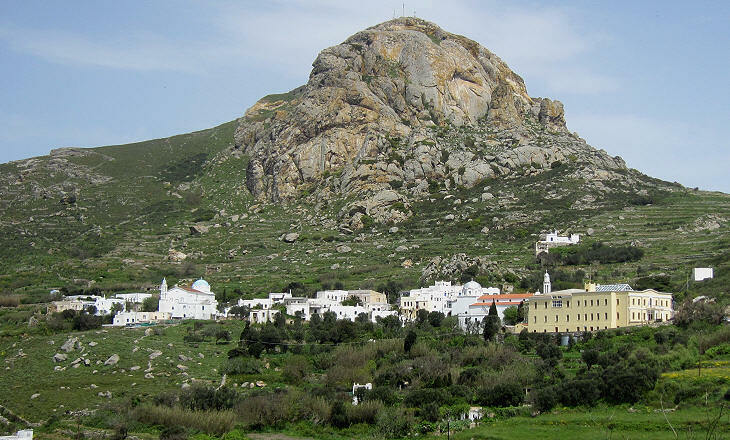 The Venetians fortified a high rock at the centre of the island which today is known as Exobourgo, while Tinos is the name given to the former village of S. Nicolò which is located on the southern coast of the island. The small map at the top of the page shows that the old name was still in usage in 1900 as the map was taken from The Times World Atlas which was printed in that year. During the Venetian rule there were several churches dedicated to St. Nicholas on the island; this bishop of Myra in addition to being one of the most popular saints among the Orthodox was regarded by the Venetians as the protector of their navy. The island had very minor importance for Venice, but after the loss of Negroponte in 1469 and of the fortresses of Napoli di Romania and Malvasia in 1540, Tinos became with nearby Mykonos the only remaining Venetian possession in the Aegean Sea, apart from Crete. 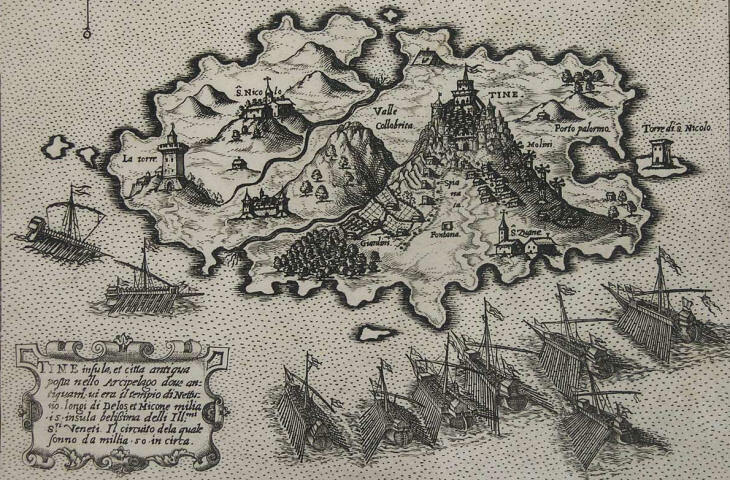 In 1570 the Ottomans waged war on Venice with the objective of conquering Cyprus; they made an attempt to conquer Tinos, but Girolamo Paruta, governor of the island, alerted the inhabitants of the arrival of the enemy so that they were able to reach the fortress and contribute to its defence. The Ottomans landed 8,000 troops and several cannon and attacked the fortress from its eastern side, but were unable to seize it; they then laid siege to it, but the nature of the ground was such that the Venetians could fire on them while the Ottoman cannon could do little damage to the fortress. Eventually the Ottomans gave up and went on with their campaign; the war ended with Venice acknowledging the loss of Cyprus, but Tinos remained in Venetian hands. During the long War of Candia (1645-69) the Venetians utilized Tinos as an advanced base from which they launched attacks on enemy convoys bringing supplies to Constantinople; in 1655 the Ottomans landed on the island but were unable to seize the fortress; another attempt in 1658 failed as well as a third one in 1661. 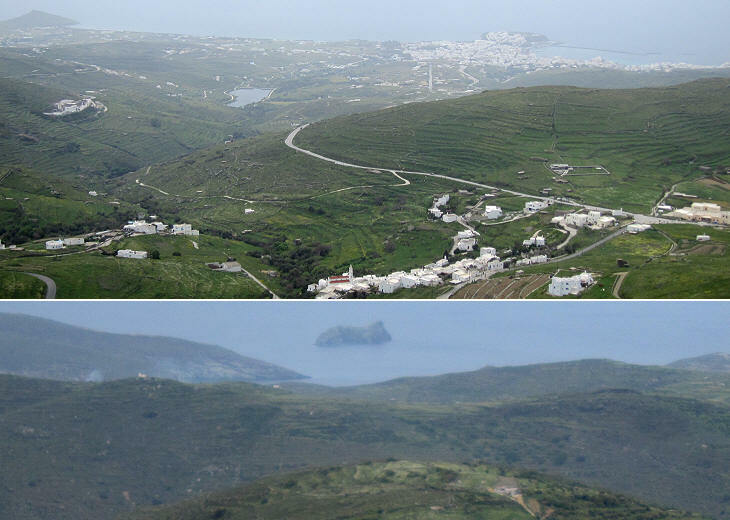 When eventually the war came to an end and the Venetians surrendered Candia (Iraklion) they did retain Tinos. In 1684 at the outset of a new war the Ottomans made yet another failed attempt to seize the fortress. In December 1714 the Ottomans declared war on Venice; the campaign started only in June of the following year; Venice relied on its fortresses to gain time and convince the Austrian Emperor to join the war. 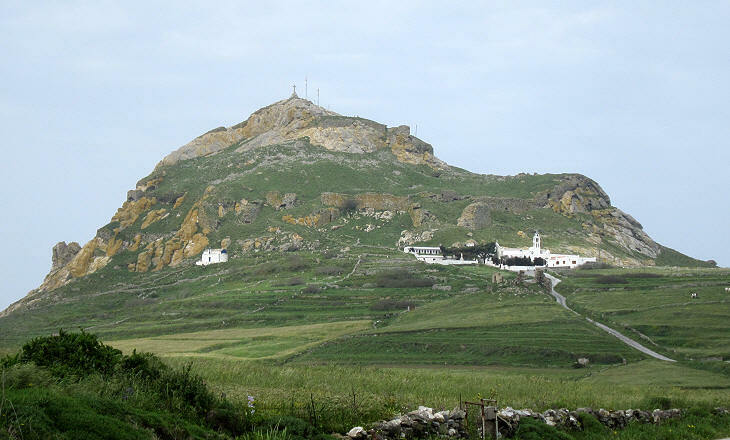 Tine la Fedele (Faithful Tinos) was regarded as unconquerable so the news that Bernardo Balbi, governor of the island, had surrendered the fortress without fighting was a great blow to the Venetian strategy and an ill omen for the prosecution of the campaign. The Ottomans promised Balbi to safely transfer him and his troops to a Venetian fortress; they duly kept their promise, thus prompting a series of surrenders by the demoralized Venetian garrisons of other fortresses. Upon his return to Venice Balbi was charged with cowardice and sentenced to life imprisonment. 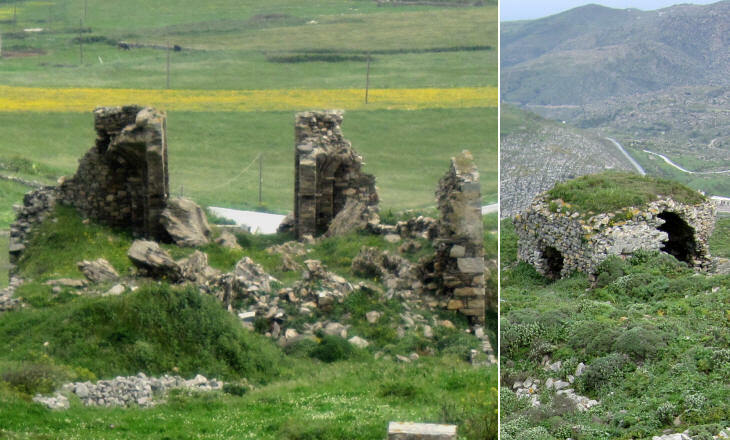 The Ottomans methodically dismantled the fortress as if to erase the memory of their many failed attempts to seize it and they deported part of the population of the island. 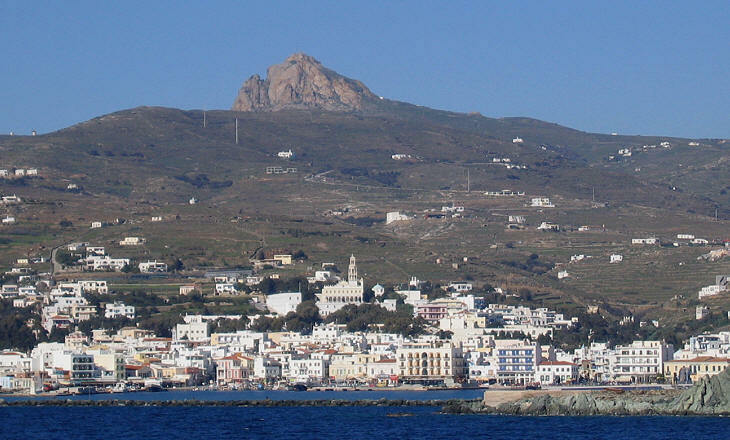 Tinos was the seat of a diocese (which included Mykonos) and when the fortress which housed the cathedral was destroyed, the bishops chose to remain very close to their former seat and they chose to live in a tiny village, Xinara, which is dominated by the massive shape of Exobourgo. 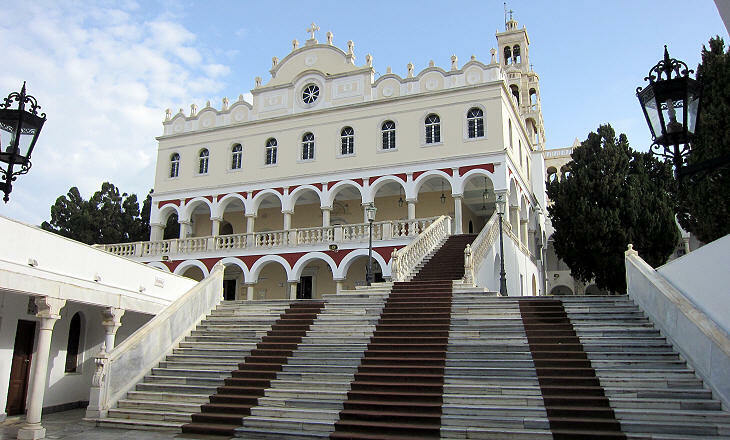 Today the Archdiocese of Tinos includes the Roman Catholics living on Andros and Naxos who in the past had their own bishops. 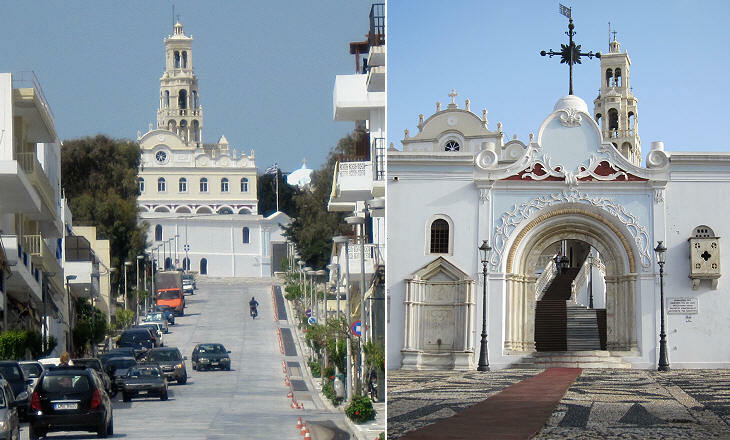 At the entrance of Xinara there is a modern church and next to it the residence of the archbishop. For two centuries however the bishops resided in a small building above an arch which was the only access to the village. 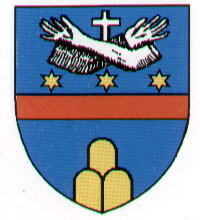 After the destruction of the town inside the fortress, the small harbour of S. Nicolò gradually became the most important settlement of the town; the Catholic church by the same name indicates the site of the old village. 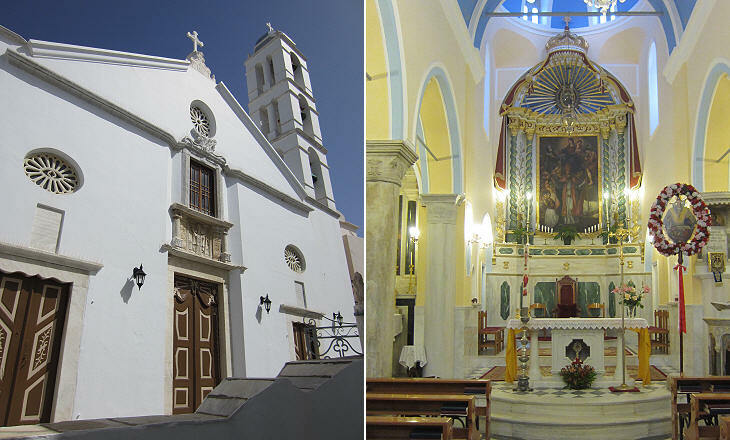 St. Nicholas' was not the only Roman Catholic church of modern Tinos and there were convents and nunneries as well. 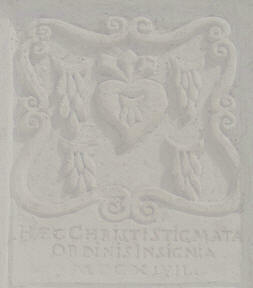 St. Francis' retains a typical Venetian aspect; the image shown in the background of this page shows the relief above its entrance: a heart pouring blood and the inscription "Haec Christi Stigmata Ordinis Insignia" a reference to the emblem of the Order of Friars Minor which shows two crossed arms with stigmata on their hands (you can see it in the coat of arms of Pope Clement XIV - it opens in a separate window). 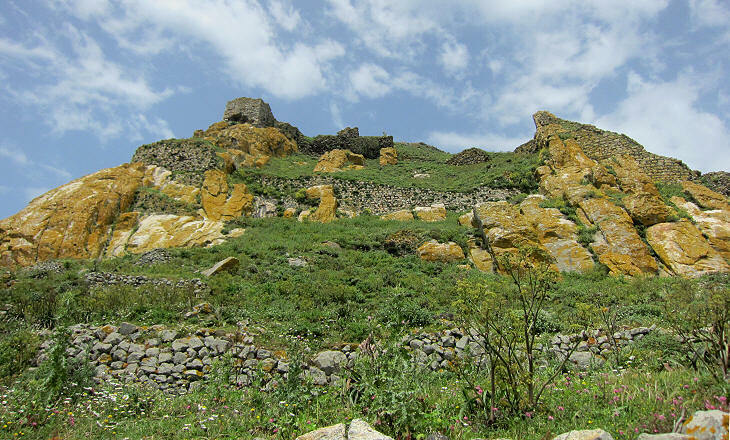 The Ottomans, after having seized and destroyed the fortress, were not interested in establishing direct rule over Tinos and they allowed the inhabitants some form of autonomous government; Latin continued to be used in several inscriptions. The inhabitants of the Aegean islands replaced the Venetian and Genoese merchants in the trade inside the Ottoman Empire. In 1783 Empress Catherine the Great of Russia forced a treaty on the Ottomans allowing the Greeks to trade under their own flag, thus promoting the development of a Greek merchant navy centred in the Cyclades. 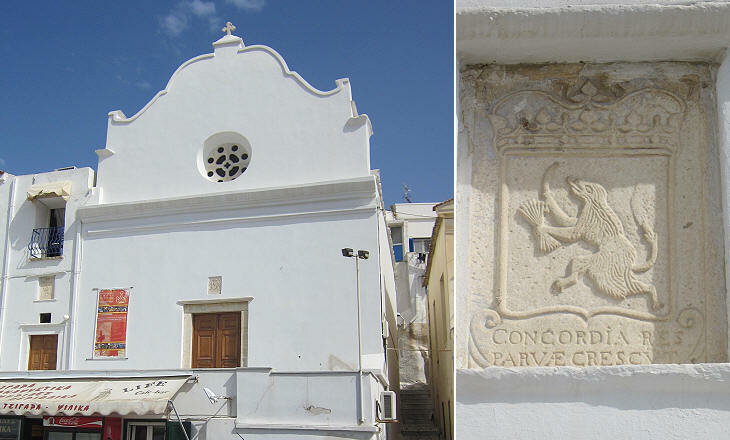 Ermopouli, a port founded on the island of Syros, became in the early XIXth century the main port of Greece. In 1822 a pious Orthodox nun had a series of miraculous visions during which she was told to look for an icon which was buried in an uncultivated field. 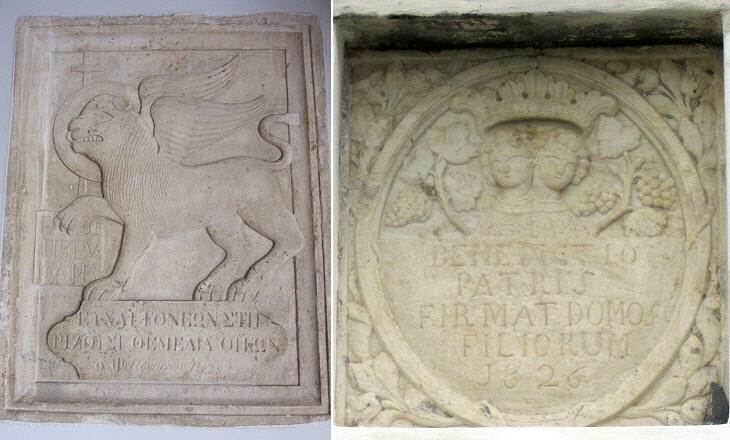 Initial excavations led to identifying the ruins of an old church but only after several months the Holy Icon portraying the Annunciation was found. 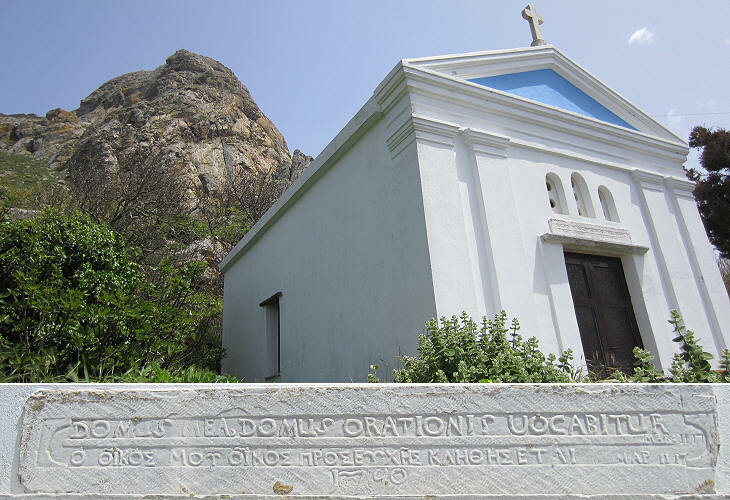 It was immediately decided to build a large church to house the icon. 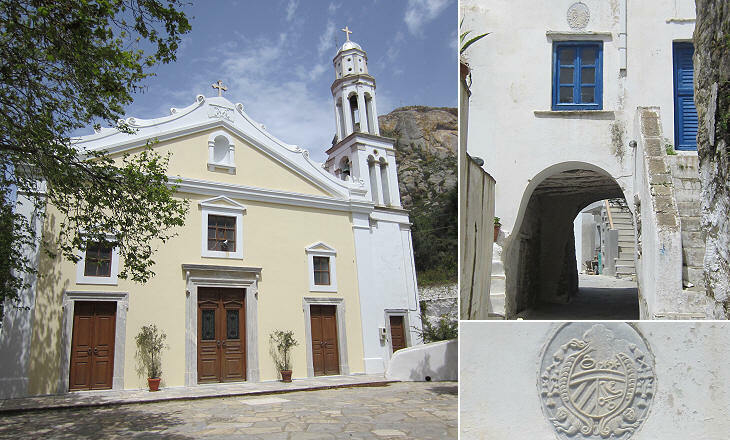 The sanctuary was completed by 1830 and it was designed by Eustratios Kallonaris, an architect from Smyrna. Special ceremonies are held on January 30, the anniversary of the Finding of the Holy Icon, on March 25, The Annunciation of Our Lady and in particular on August 15, The Assumption of Mary. 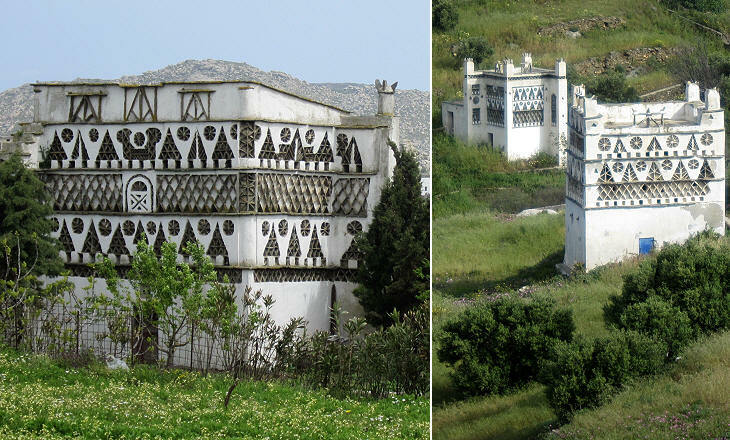 Dovecots are a distinctive landmark of Tinos (and Andros); most of them go back to the Venetian period. 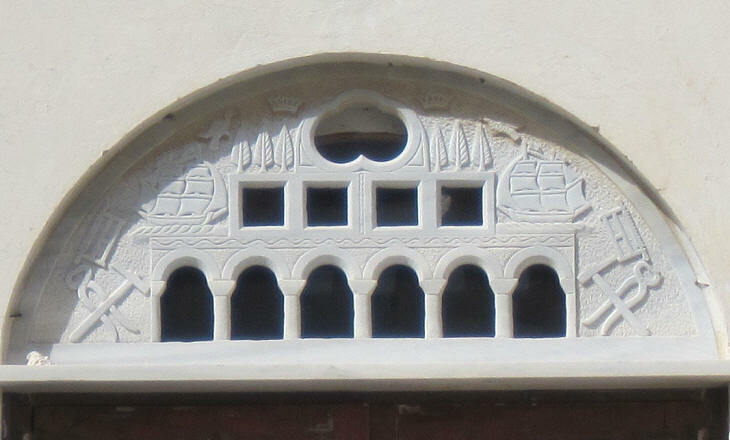 You may wish to see Torresano di Breganza with polenta, a typical Venetian dish - it opens in another window.